Home » Incontinence Products » Chair Pad 21" x 22"
Excellent product. Super absorbent and a good furniture protector. Machine washable too. Our reliable Chair Pads have been designed for discrete and respectful use by those dealing with the issue of incontinence on a daily basis. 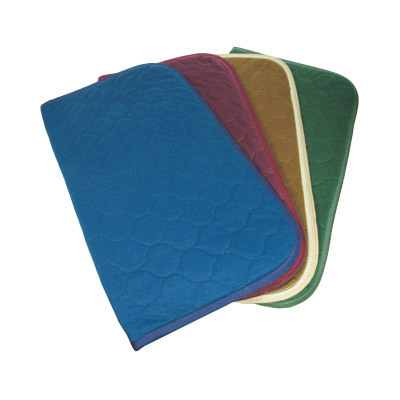 Available in an array of colours to suit specific needs, these machine washable pads have been made from a plush velour for exceptional comfort and features an impermeable barrier to draw liquid away from the surface in minutes. Each pad can hold up to 1 litre of liquid at any given time and does so in a discrete manner to keep the dignity of your residents at the height of importance. The chair pads can also be tumble dried to reduce the wait between uses on a medium heat before being returned to the user. A plush and comfortable alternative to unsightly plastic sheets and allowing those in your care to continue with their day-to-day lives with ease. We also stock a wide range of Incontinence Products including Adult Nappies, Bed Pads and Waterproof Bedding.